I arose at 7am having not slept well. A change in life style, excitement or worry about what lay ahead for the next two months could have been responsible for that. I packed the rucksack and headed off to the post office to post the old waterproof kit looking forward to shedding some weight from the backpack. It opened at 9am. Everyone had already set off. Finally at 09.10 I paid a lot of money to send 2.3kg back to Scotland. I was happy that it was unnecessary weight and was happy to set off for the day a bit lighter. A long climb out of the valley followed. Not steep but steady. The farmland changed to wonderful woodland and I started to enjoy the walk alone. 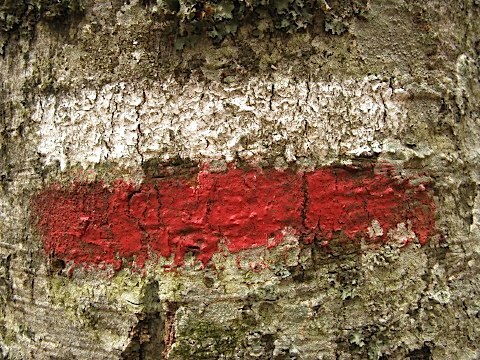 By now I realised that the red and white stripe marked the way on the GR65 (Grande Randonnée). The GR65 in France is the Via Podiensis to Santiago de Compostela. The air became cooler as I climbed and light rain again blew around. I caught up with Marie and walked with her for a while. Sophie had sore ankles so had gone ahead by taxi to stay in the gite in La Roche. She would meet her there. I discovered they were sisters and originally from Brittany in Northern France. After we came to the path that led her to the Gite I continued on to Saint Alban sur Limagnole alone. It was quite a few kilometres to the town on a good track through dense woodland. The rain was steady and light and the new poncho was working well. I stayed at the Maison du Pelerin. The owners of the gite invited me to join them for the evening meal together with the family and the other pilgrims. Jonathan from Sydney was at the table as was Frédéric who had stayed in the same gite in Saint Privat d’Allier. The stories abounded of ‘pilgrims’ who the owner had seen getting into cars after leaving the gite. ‘Cheats’ he called them. There was no way he could tell the real from the cheating pilgrims so he let all stay. ‘A pilgrimage is supposed to be about walking each day and not using a car’ he said. Everyone scoffed and agreed. The stay in Saint Alban was my first experience of ‘donativo’ – just leave a donation for the nights accommodation and meal.